This article will show how to Encrypt Amazon EBS volume. Now if you want to encrypt a new volume its straight forward but when it comes to encrypting an existing EBS volume it becomes tedious task. Usecase scenario for the same : A company has come up with new security and compliance requirements where they want to protect their data-at-rest. They have selected an option to encrypt all the data in their existing EBS volumes. 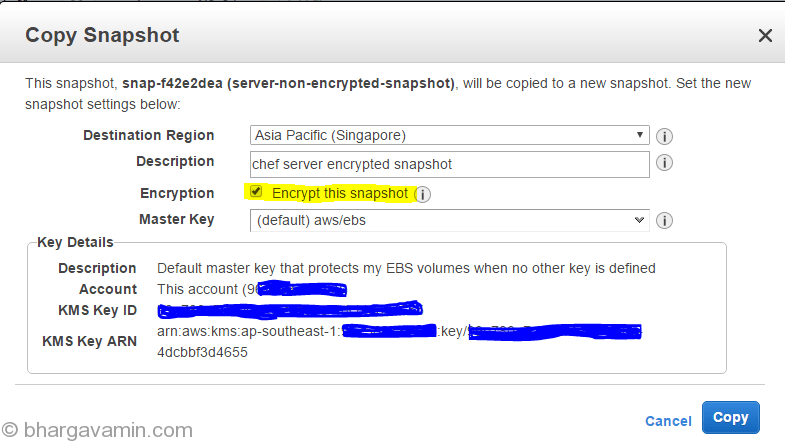 It is very simple, actually AWS has made it simple with just 5 steps you can encrypt EBS volume (existing). Go to Volume option on left once instance is turned off. Proceed with appropriate details for the snapshot and hit create. Once Encrypted copy of snapshot is created successfully. Create a EBS Volume from it. This volume will be encrypted and ready to be attached with instance. Create a volume from the encrypted snapshot. You can change properties like size, type or AZ for the volume here. Note : Please create volume in the same availability zone as your instance. When Volume is ready, attach it to the instance. REMEMBER First remove the old un-encrypted volume then do the following task. You have now create and attached an Encrypted Amazon EBS Volume without any hassle. Your data will be the same plus added encryption acts a layer of security which will protect your data-at-rest. Few things to keep in mind : You won’t be able to launch the same encrypted snapshot or an Amazon AMI in any other account. Once encrypted you cannot change it, the encryption key will be managed by AWS so you don’t have to worry about losing it. That’s it, Thank you for reading! Please leave your queries on comments section below. I’ll try my best to answer it asap. Next post West Indies : The World T20 Champions!